How do you clean or brush dog's teeth? Thread: How do you clean or brush dog's teeth? I saw a lot of product on the internet or petco. There is toothpaste + brush set, a fluid that you put in the water so that your dogs teeth are taken care of every time they drink water. (Like gurgle mouth wash I guess). I don't think cleaning process is not same as we do. You don't really make dogs gurgle and spit out the water do you? Please teach me how to clean teeth and let me know which formula you prefer or works best? Thank you. Last edited by Dave|Xoxide; 01-20-2008 at 12:35 PM. Heat vent is right below it and I can see outside through window perfectly. LIFE IS GOOD!!!!! I prefer the natural way... bones. At approx 8 years old.... nice white puppy like teethies. I have to say that no matter how much I brushed my dogs teeth, there was still plaque that I just could not get off. 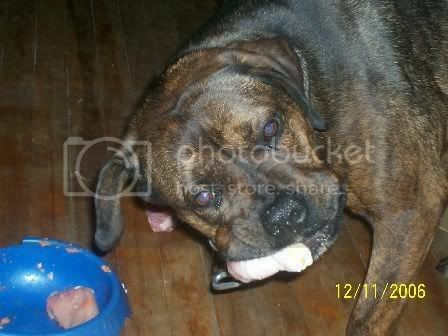 I have started giving him raw meaty bones and that plaque is now gone. I could not believe how clean his teeth were afterwards. He's had all the commercial products available that are supposed to clean his teeth, but the results are not even comparable to the results of the raw meaty bones. For some people and some dogs-no big thing. As for me, I'd take him/her either to the vet or a groomer for a good cleaning at a minimum of once a year. Many diseases can start in their mouth besides tooth decay and horrendous breath! Don't skimp on oral hygiene whether you attempt it or have a professional do it. Have you hugged your pets today? I have a papillon that has horrible teeth so I have done lots of dental care, with good success. First, if the vet says they need a dental then get it done. It is easier to keep clean teeth in good shape, almost impossible to clean up an existing mess. Second, I brush my paps teeth every night before crating. Make friends with your dog while watching tv or something, get them all relaxed. This takes some practice to get the dog to ALLOW you to do the brushing. My pap sits on top of her crate for me. I put a folded bath towel on the crate so she doesn't slide around. I use a battery operated Colgate Motion brush because it has a very small brush head, easy to get into tight spots. Also,cheap...can be had at Walmart for less than $7. I use the Petrodex poultry dog toothpaste. Don't put gobs on, just enough to cover the brush head. Never use human toothpaste. I set a timer for 3 minutes (4 when I first started). I put my index finger in the dogs mouth and pull back the lips to keep it out of the way. And I keep my finger between the upper and lower molars so that I can get a good brushing on them without her closing her mouth down and covering them up. (I have a small dog with small teeth, if your dog bites down hard you may have to put a small corner of a washcloth in there to keep the jaw open) So I start on one side way in the back, do the upper and lower molars, be sure to look for a tiny tooth behind the molar (I don't know if all dogs have them but my pap does). I work the upper and lower molars moving forward a bit until you get the upper and lower little teeth in front of the molars, about up to the incisors (the long teeth). Re-load with toothpaste and start on the molars, etc on the other side, up to the incisors. Re-load one last time and do the incisors and front teeth, upper and lower. If you still have time on the timer go back to the areas where your dog seems to accumulate the most plaque and staining. Third, because our dog has severe gingivitis (you will see a red line above the tooth and lots of plaque usually at the top of those teeth, maybe even some bleeding) and we are trying to avoid it for the future (gingivitis is a bacterial accumulation and can migrate to the heart and kidneys over time) the vet did an application of a new product called Oravet while she did the last dental. The application at the vet lasts a few weeks. Then they send you home with a home care pack that has 8 small containers of the product, large dogs would use one pack each week. But for smaller dogs, you could get at least two applications per packet so it would last you about 16 weeks or maybe even more. It is a gel type thing and I find it works better when slightly warmed, melted a little otherwise it has a slippery waxy consistency. So while I'm brushing the dog on Sunday night I leave the packet on top of the stove where my pilot light is. I have also heard that you can microwave it slightly if you take off the foil cover first. After brushing, then I have the Oravet gel right near me, use the washcloth to dry off an area to apply the gel (I find it sticks better if the teeth are dry), and apply it along the gumline, working all the way around just like the brushing pattern. The give you applicators in the kit. Kit costs $25. Fourth, because the cat formula has worked wonders for my cat who has also been a dental waiting to happen! I buy the Science Diet dog oral care chunks for my dogs. $10/bag at Petco or similar store. I don't feed them as food because the ingredients are not high quality. But when my dogs go out specifically after eating (2x/day) I give them an oral kibble when they come in, hoping to scrape some of the plaque off from the meal. So one bag lasts me for 3-4 months or so with two dogs, 4 chunks per day total. Lastly, I do allow limited chewing on pork pizzle type sticks. Limited, my dogs get to chew on them for an hour or two while I watch tv at night, maybe 3x/week. I was buying the beef bully sticks but I got weirded out when mad cow and CJ disease became issues with beef, US or not. (I work in a medical lab and we get to read all the journals) I rarely (maybe 2x/year I buy) give a rawhide flip chip, roll, or knotted bone that I buy at Walmart $3/package...used to be Dr Dentley brand, now I think they are Hartly or something like that, made by Hartz, has a blue strip at the top of the package... they are impregnated with an enzyme (hexophospate???) that creates something similar to a peroxide reaction in the mouth with saliva. It has good studies proving its usefulness. Don't be fooled by "dental chews" that list parsley extract, chlorophyll, mint, baking soda, etc as the active ingredient. They will only mask the doggy breath, not treat the cause. You can purchase CET chews at the vet's office or Petrodex chews at most pet store but they are much more expensive and contain the same enzyme ingredient as the Walmart chews. Of course I also keep a big supply of rope toys, nylabones (mine like the blue bumpy ones), kongs, etc. Anything to keep them massaging those teeth and gums every day. Besides rawhide the only thing I avoid is Greenies. They seem to be the hot thing on the market right now but I've heard some stuff from my vet about dogs getting really sick from eating them. Your dog will probably have nice teeth, most dogs do. And you will probably only need a few of the things that I use, and much less frequently, except for daily brushing. A dental cleaning costs $250+ in my area at the cheapest vet. So consider the small expense of the products above to be quite a savings over a vet dental. He's had all the commercial products available that are supposed to clean his teeth, but the results are not even comparable to the results of the raw meaty bones. This might be a stupid question, but where do you get raw meaty bones from? Although I teach ALL my dogs to accept teeth brushing, I hardly ever brush their teeth, because I give them RMBs and bison/beef marrow bones and it keeps their teeth cleaner than anything else I've ever tried! Do you ask for a specific cut/type of meat? Are some better for dogs than others? I gave pheasant necks once when I ended up with some. I would also love to know what other RMBs would work and are safe. I want to give my dogs more variety, and I just stumbled upon a private meat place that has things like rabbit and venison! As others have mentioned, raw bones are the best. Actually, a variety of RMBs is best, since they will chew different types of bones differently. You want a size appropriate bone. A chicken neck, for most dogs, will do little to nothing in terms of teeth cleaning. Most dogs can swallow them whole or after only one crunch. 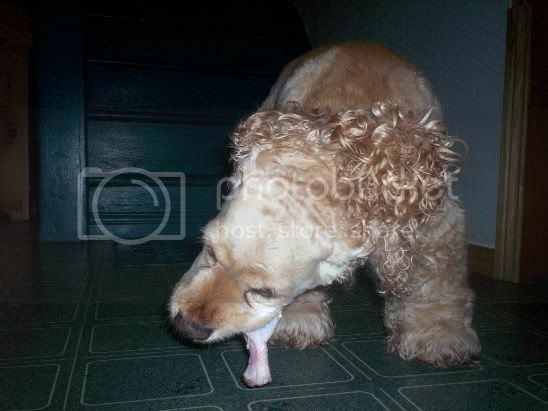 A turkey neck, OTOH, is much larger than a chicken neck and will be much more beneficial for most dogs. However, take a tiny little chihuahua and a turkey neck may be too large, and a chicken neck may be more appropriately sized. Raw bones we giver our greyhounds (50-70 lbs) - chicken backs or chicken frames. Turkey necks or wings. Deer femurs (if they are still pretty meaty) or shoulder blades. Pigs feet. RAW beef marrow bones (not smoked). Rabbit (usually 1/3 or 1/2 a rabbit). Basically anything is pretty much fair game as long as it is RAW. 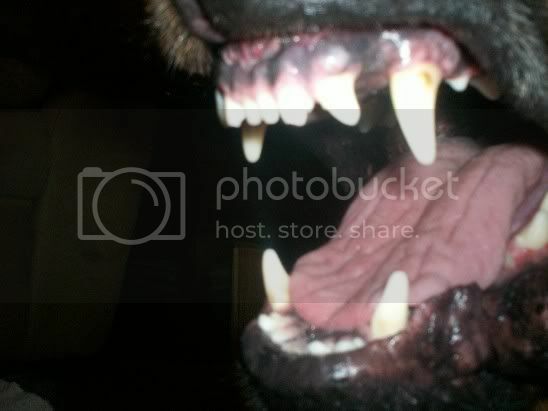 A dog can chip a tooth on a heavy, weight bearing bone of a large animal (i.e. cow femur), so some people avoid those types of bones. We will still give them as long as they are meaty and sinewy. The goal is for the dog to pull and scrape the meat from the bone, not necessarily try to crack the bone open like a big jaw breaker. Thank you very much for all of you. I guess answer is the RAW bones. Do they sell bones only at the grocery stores? or chicken, turkey necks? You can get them from a grocery store or a butcher. I look for sales and stock up the freezer There may also be a raw feeding co-op in your area (many of the groups have yahoo lists you can subscribe to). These groups buy in bulk from a meat distributor and often get better deals than you would at a grocery store. We get chicken frames from a chicken plant near Atlanta....which is right next to a dog food factory, ironically LOL You have to buy at least a 40 pound box from them though. Most meat distributors require bulk sales, if they deal at all with selling to the general public. You can look through your phone book and start calling around. With only a few dogs, though, it's probably just easier to buy from the grocery store. Ethnic grocery stores often sell bones and bits that some of the more mainstream stores may not, so don't pass those by! And only feed bones when supervised. You are still at risk of the dog choking, perforating an intestine with a sharp piece that was swallowed, or chipping a tooth. But I know that lots of you feed bones with out any problems. But the new guys should be aware of some of the pitfalls of feeding bones. Thanks again, When you feed necks, do you take the skin off? After you freeze the bone, you defrost it before you feed dogs? Once you give a piece of bone (mine is beagle, I guess small bone would be find) how long can they chew on it without risking of getting other bacteria? Actually I have beef bone in my freezer right now. but very small, about half of an inch high, 2 inches wide. You can see brown stuff inside(is this marrow? ), will it be too small for her? She has bad habit to just swallow food w/o chewing them. A chicken neck, for most dogs, will do little to nothing in terms of teeth cleaning. Most dogs can swallow them whole or after only one crunch. R.I.P. - Eevee ~ 15-year-old F Border Collie Mix - My Heart Dog! Here go BeckyBeagal. This is a good website about feeding raw. Lauri is on the same German Shepherd forum that I am on. Heres a list of links for raw feeding ( you dont have to consider the whole raw fed thing,) but in those links are great tips and "safety" measures to take. Thank you for your info. The sites you gave me were great if you are considering barfing your pet. However I am not even considering it now, I just want to feed the RAW bones to keep clean teeth. Briteday replied to freeze the bones. Thus other question rose up: do you defrost before you give it to your pet? How long is safe time frame for my dog to chew on raw bone, hour or a day? If anybody can answer these, I would appreciate it. How to clean a Kong Jump'n Jack?